"It's a slight story of a priest who was supposed to have found a treasure." If you were one of the legion who read Dan Brown's runaway bestseller The Da Vinci Code�with his whole could-be-based-on-history/shakeup-the-foundations-of-Christianity plot�then this release from The Disinformation Group might seem like the perfect compliment. And there certainly have been a ton of secondary books and documentaries to get thrust forward since the success of Brown's book, even if a number of them were written well before his. Brown took all the dry research that had come before and nicely packaged it into a thriller format, reawakening an interest in the possibility that maybe the Bible isn't the be-all, end-all book of facts that it is believed by many to be. Right there in giant letters on the cover of this disc it says EXPLORING THE DA VINCI CODE, as if in fact that is the title of this 2000 documentary from author/researcher/historian Henry Lincoln. 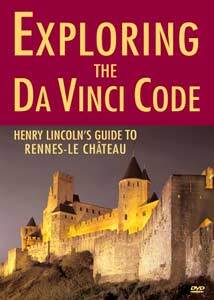 That's more than a bit misleading, because the actual title is the somewhat less exciting sounding Henry Lincoln's Guide To Rennes-Le-Ch�teau, referring to an area in France that figures prominently in the premise of Brown's book, and where a lot of researchers believe the answers to a number of Christ-related mysteries reside. Lincoln seems plucked out of Central Casting, a spry, white-haired academic who originally followed clues out of an old paperback called Le Tr�sor maudit (The Accursed Treasure), a book he accidentally came across in the late 1960s while on holiday in France. That chance discovery turned into an obsession of sorts, and Lincoln has written (and co-written) a number of books (Holy Blood, Holy Grail being a recommended read) outlining the mysterious life of 19th-century French priest B�renger Sauni�re, ancient parchments, secret societies, geometric patterns, and a revelation that could ultimately rattle the tenets of the Christian world. In this guide to Sauni�re's Rennes-Le-Ch�teau, the flow alternates between being a gentle travelogue of the French countryside and its tiny villages, to suddenly shifting gears into large chunks of strangely fascinating historical data that sometimes seems a little difficult to follow unless one is paying close attention. It helps to have done your homework ahead of time if you really want to be able to keep up with Lincoln, because he barrels forward with or without you. No doubt that Lincoln seems an overflowing fountain of knowledge, full of offbeat anecdotes, some personal, most relating to Sauni�re. He is one of those affable characters you would love to have be your personal tour guide of Rennes-Le-Ch�teau, so you could stop him periodically and ask him to go back and explain something in more detail; something you just can't do here. With this DVD, it's not so much an add-on to Brown's novel, and I would wager that most readers with no previous knowledge of the subject will be either horribly dulled or confused by Lincoln's lecture-like recitations. If you've read Holy Blood, Holy Grail, or any of the other non-fiction accounts available on the web, then Henry Lincoln's Guide To Rennes-Le-Ch�teau will be a nice plus, and give you the chance to see and tour the intricate structures and rolling countryside without having to flex your brain to also follow the sometimes vague narrative. As eye-candy scenery, though, it is beautiful, so at the very least you can tune out Lincoln and just take in the view. Image Transfer Review: Lincoln's doc has been issued in 1.33:1, a pleasant enough transfer full of deep golds and lush greens. Detail is very sharp and crisp (even during interiors of old, dimly lit churches), and considering this was apparently shot on a meager budget, the quality here is above par. No trace of any source print problems to be found. Audio Transfer Review: The 2.0 stereo audio transfer doesn't have any glaring faults�all of Henry Lincoln's narration is understandable and clear�but much of it has a very flat, dry feel to it. Some of the sequences where Lincoln is speaking outdoors have a tendency to clip slightly, and though it doesn't present any listening problems, it seems more noticeable when leading into a piece where the narration was done under more controlled conditions. Extras Review: Here's a title begging for extras (even a dreaded onscreen text article), something that would fill in the cracks for the casual observer drawn in by the enticement of The Da Vinci Code. But there's nothing here, not even a trailer or a Lincoln bibliography. The disc is cut into 20 chapters, with no subtitle options. This heady part French travelogue/part academic lecture/part personal interjection sees marketed to be an adjunct to the novel The Da Vinci Code, despite the fact that Henry Lincoln had written about the subject years before Dan Brown ever wrote a word. Be warned though, this is not for the novice or casual adventurer, as it requires a fair understanding of the story of the priest Sauni�re, or you may be hopelessly lost.